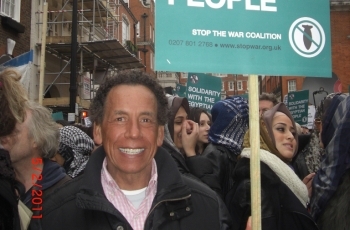 Eldridge Culverwell reports on his involvement in human rights campaigning and taking part in the activities leading up the recent political changes in Egypt. Conway Hall, 8:45pm, Wednesday 2nd February and people are milling in the main hall and the entrance lobby exchanging ideas, enthusiasm and solidarity for Egypt with one another. The meeting had ended and the energies of support filled the Hall. During the meeting, speaker after speaker spoke about the magnanimity of the passive resistance, the cautious approach needed towards the military, the amazing curtailing of the states notorious police force, the courage, dedication and determination of the throngs of people gathering in Tahrir Square and the various cities of Egypt. Voices of support for the Egyptian people echoed from the Syrian, Algerian, Palestine, Yemen, Tunisian and Libyan flag waving support. Spontaneous cries of “Mubarak must go” punctuated the air in both English and Arabic. Saturday 5th February 1:45pm, weaving my way through the busy Oxford Street shoppers I peel off onto a side street away from the consumer madness, greeting the tranquillity with a sense of relief. Ten minutes later I emerge onto Grosvenor Square greeted by a sea of people waving Egyptian Algerian, Tunisian and Syrian flags. Drums beating a joyful tempo, chants of “we are all Egyptians” fill the air. On the neatly constructed stage in front of the American Embassy, Egyptian speakers infuse the message of solidarity with personal experiences of abuse at the hands of the state police and the great pride of being able to demonstrate without fear and intimidation. The age of political reason for many years suppressed, is slowly returning to the Arab world. The heavy suppressive burden of colonialism and bulling markedly ebbing away. With the flags of different countries fluttering above our heads, banners representing various organisations, masked their support message in bold lettering, masses of individual placards amplifying the message from human right groups swaying above the people, chants and songs, we slowly march towards the Egyptian Embassy. Cars along the way toot their horns, onlookers cheer, while others just stare while the crowd snakes its way towards the Embassy. Solo cameras, television and radio crews capture the mood of the march. Police stand by and watch as the crowd singing, chanting descend along the roads converging at the Egyptian Embassy. 11th February 2011, I sat glued to my television screen as the jubilant news filtered through that Mubarak had finally abdicated his peacock thrown. 12th February, I clamber up the stairs at Charring Cross underground station into the bright midday February sun, the chill air blankets me as I step out on to Trafalgar Square. Scenes of great joy are clearly visible both on the giant erected screen and the vast amount of people gathered in the square to celebrate the exit of Hosni Mubarak. Mingling with the jubilant crowd, tears of joy are visible on the large screen and amongst all the excited people in the square. Trafalgar Square commonly known as the Parliament of Britain demonstrated that it is also the Parliament of the world. Different speakers praised and thanked the brave peaceful people of Egypt for their courage and message of hope to all the oppressed people of the world. “The Egyptians have inspired us, and they have done so by putting the lie to the idea that justice is best gained through violence revolution.” President Barack Obama. Mr President, put your words into actions and stops supporting dictators and withdraw your troops from Iraq and Afghanistan. Eldridge Culverwell is a Human Rights Activist. He took part as a Parlimantary Shadow on the 2010 OBV Parliamentary Shadowing Scheme.